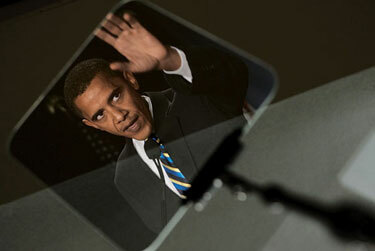 Obama’s Teleprompter Stolen at Virginia Center Commons Mall | Virginia Right! In case you had not heard, President Obama is visiting Virginia. In fact, he will be in Richmond tomorrow campaigning pushing his jobs bill and kissing more babies. Of course, this means that the airport will most likely be closed for the morning and part of the afternoon. While the President’s exact route and exact travel plans are not made public for security reasons, most of the details are going to be the same as his usual bus trips. A couple of hours ahead of his visit, a massive cargo plane will arrive carrying the Canadian made buses he is using to promote his American Jobs bill. At some secret time, Air Force One will make the 20 minute flight from whatever secret location the President has been hanging out, using enough fuel to heat the entire city of Richmond for the winter. Of note, an unfortunate incident has already occurred. It seems that the white Van holding TOTUS – the Teleprompter Of the United States – was stolen from the Marriott Courtyard at Virginia Center Commons. Thankfully, the President was in no danger at any time! Obviously, Obama would never stay at a Courtyard by Marriott, nor would he travel by Van. For those outside of the area, the irony must be explained, as only locals will know the details. First of all, the Courtyard by Marriott is located at J.E.B. Stuart Parkway named after a famous Civil War General who ironically has a Hollywood connection just like the President! Obama is resting his reelection hopes on his friends in Hollywood and J.E.B. Stuart is resting eternally in Hollywood Cemetery in Richmond. And that is not the only irony going on here. One of the most fiery and impassioned speech-makers of his day was born a mere stones throw away from the Courtyard by Marriott. These impassioned words were delivered, of course, by none other than the original TEA Party member himself, Hanover County’s own, Mr. Patrick Henry. Defender and advocate of the liberty that the Obama Administration has so diminished through executive orders and Progressive whims of Utopian fantasies resplendent with unicorns and dancing fairies. Fortunately, the white Van was recovered near the Richmond Airport and word is that all was recovered intact. But local folklore is already taking root. Some believe that the Teleprompter itself commandeered the Van in a fit of lonely anticipation and drove itself and his van to the airport to await his master’s arrival. Still other folk believe that it was the ghost of Patrick Henry turning in his grave and possessing the van and through sheer will teleported the van and it’s contents to the fastest exit from the state – the Airport. The very thought of a politician speaking words written by others from a machine was so distressing to Henry that his spirit awakened to purge the teleprompter and it’s words of enslavement yet to be spoken from so close a proximity to his birthplace. And yet another school of thought are convinced that the spirits of those disturbed by the recent earthquake centered a few miles away in Mineral, Virginia were expressing their disapproval of the Obama Administration’s decision to exclude the stricken area and crumbling dwellings from Federal Assistance in the form of disaster relief. The nearly 4 dozen aftershocks continuing to disturb their eternal sleep. Or it could have been one of the Democrats running for reelection in Virginia’s General Assembly who are desperate to keep their distance from their President for fear of losing their elected jobs! These guys are running from Obama like he had the Plague! But most likely, the thief had no idea what was in the van and was hoping for a load of Televisions or Game Consoles. And when they found all they had was a Teleprompter with empty words, they abandoned the worthless plunder. But the most ironic bit of all is that the thieves were likely desperate and unemployed people just trying to feed their families in the new reality of the Obama Economy. But we are all glad the President recovered his expensive taxpayer purchased equipment. We’d hate to have him buy more. Probably from Canada. Richmonders are a welcoming bunch of friendly people. In fact, a large group will be gathering to welcome the President outside of the closed gathering he is attending at a Chesterfield County fire-station tomorrow. The Richmond TEA Party wants to let him know how much they love his rules and regulations! Hope he waves.